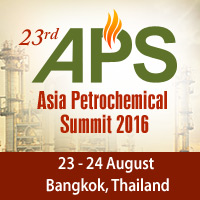 CMT’s 23rd Petrochemical Summit takes place in Bangkok on 23-24 August, where once again, industry experts across the region will discuss the current issues affecting the Asian petrochemical market. The petrochemical industry is seeing increased growth despite volatile conditions across several sectors. This lift is being fueled by low oil and gas prices, providing higher margins. The industry seems resilient despite volatile crude oil prices and global economy uncertainties. The summit starts with an analysis of the crude oil trends and impact on the petrochemical industry by Dr. Jaap Kalkman, Managing Partner, Global Energy & Utilities Practice from Arthur D. Little. Consultant from Nexant, Kanokwan Saktrakool, also delves into the US petrochemical supply and impact on the global petrochemical landscape. Also speaking is Iran National Petrochemical Company’s VP, Mr. Mohammad Peyvandi,addressing challenges in petrochemical industry globally and in Iran. Makarand Dixit, Head of Marketing of OPaL details their cracker project status while PDH projects update and China petrochemical outlook is shared by Qu Liang, Analyst, Petrochina Planning & Engineering. Rewati Jain, Head of Commodities, Essar Oil presents the “Asia Aromatics & Derivatives Market Outlook” while Vincent Wang, Head of Marketing, Milliken Asia analyses the challenges and opportunities for Polyolefins in Asia. Dr. Amonthep Chawla, Head of Research Office & SVP, CIMB Thailand Public Company, also speaks at the summit. Email huiyan(at)cmtsp(dot)com.sg or visit the event website for more information.